Currently, many people are struggling to find mental health positions. This includes not just new students entering the field, but also established professionals. Many of the people who are employed report extremely low salaries and declining benefits. In fact, Master's degrees in Psychology and Social Work are the top two worst paid Master's degrees in the United States. Can you get a good job as a therapist in 2015? Does this mean there are no great jobs available for social workers and therapists? No! It does mean that the great jobs are fewer and farther between then in the past. It also means that the competition for great positions is fierce- and you are less likely to "stumble" into a great paying job in 2015. You may need to put more thought into positioning yourself to get the job that is going to be best for you. Should you get a job in 2015? Despite a not fabulous job market and low wages- many therapists will tell you that they will choose a job over private practice because it is more secure than being self-employed. However, we've talked to enough therapists who have had jobs disappear because of grant funding, restructuring, and unexpected closing that we know that just "getting a job" doesn't make things secure. Whether you decide to look for a position with a non-profit or company, or create an opportunity through private practice is really a personal decision. Both can be secure sources of income. Where can you find financial security as a therapist? The only financial security you will ever have will come from you! Whether you choose to get a job or keep a traditional job in 2015, have a part-time private practice, or move into full time private practice isn't the issue. You need to learn how to trust your ability to make an income. That might mean creating more options for getting a new job if your current job went away in 2015. That may mean developing a realistic business plan for your private practice in 2015, or it might mean upping your clinical game in 2015 so you are sought after by people in your area. A few years ago, I went to an annual conference for the California Association of Marriage and Family Therapists. I met several pre-licensed therapists there that had just graduated. And guess what- they had multiple options for paid internships right out of college! I knew this wasn't the norm- so I started asking them more about their story. What were they doing differently? The two biggest takeaways: networking and business savvy. How are you getting to know people in your community? What kind of real relationships are you building inside and outside of the mental health community? The truth is, whether you want to get a job in 2015, or be successful in private practice- building relationships is key. This isn't about just handing out your business card to as many people as you can- this is about letting people get to know you and your heart. People like to work with, and refer to, people they know, like, and trust. How are you allowing people to get to know, like, and trust you? One of the things that business savvy people know is how to present themselves. They have a clear vision of where they are going, they develop a specialization, and they know how to articulate that specialization. All the networking in the world, without sharing a clear vision or specialization isn't going to lead you to great job opportunities, or bring clients to you. Are you able to articulate what you do, and who you are? Have you given yourself permissions to become an expert? 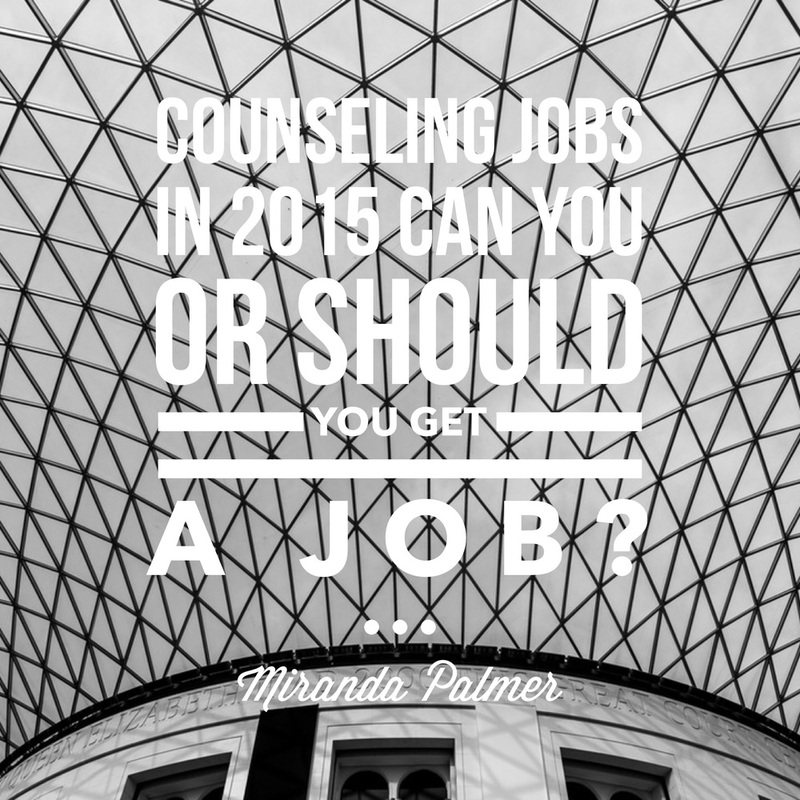 Can you, or should you get a job in the mental health field in 2015?